Plants native to the tropical regions of the world (Mexico, Central American, the Caribbean, parts of Africa, India, the South Pacific, etc.) are logically referred to as "Tropical Plants" or "Tropicals." 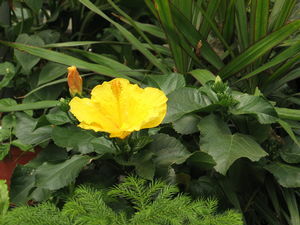 These regions of the world often have consistently warm and humid climates, which make plants thrive in the outdoors. In non-tropical climates (like most of the United States), they are often kept as houseplants or set outside only in the warmth of summer. Any Virginian who has ever been smitten by palm trees and tropical landscapes while on vacation can build a similar oasis in their own backyard. A number of tropical plants, including palms, are cold-hardy and worthwhile perennial additions to the home landscape, providing texture, whimsy and even evergreen winter interest … download article “Introduction to Cold-Hardy Tropicals for Virginia Landscapes” by the VA Cooperative Extension. Because our stock of indoor foliage plants changes so frequently, please call to be sure we currently have an item in stock. 22902 Clerodendrum Bleeding Heart 10" Hoop 30"
To check the immediate availability of any of our plants, please feel free to call us at (540) 943-8408. A number of tropical plants, including palms, are cold-hardy and worthwhile perennial additions to the Virginia home landscape.